This issue is dedicated to our alumni who found themselves with trials and tribulations from the recent hurricanes. Tom O. A note of thanks for all the expressions of concern during "My Affair with Irma"! My affair was short-lived from Friday the 8th through Wednesday the 13th at which time I departed Brian and Brenda's safe haven in the Atlanta area. I returned to the condo at about 2:45PM on Wednesday! Again my thanks to Brenda, Brian and family for looking after GranPA. The condo came thru with surprisingly minimal damage; A little roof damage that allowed water seepage into 8 floors from the roof down to first floor. Most of our fencing is down and will to be replaced, garage roof damage and other minor damage - all in all, we survived quite well. As of the time; we got electric power in the condo complex yesterday (Saturday) but our elevator service has not been restored as yet. From my observation: the town of Cocoa Beach did well; Street lights were out until yesterday. Car drivers were very courteous by approaching intersections and allowing all 4 ways to proceed with courtasy. Most restaurants were closed. One of our grocery stores became operational on Wednesday. My NFL football "Sports Bar" is operational for my 1PM Eagles kickoff!!!! My sincere thanks to all for the expressions of concern that you all provided and especially to my family for the Hospitality in Atlanta and the calls I received! 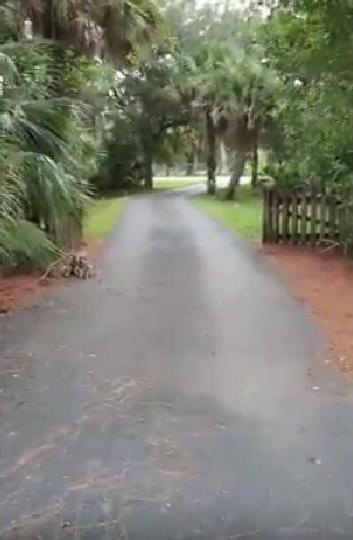 I live close to the barrier island on the east coast..actually about 80 miles east of Orlando. IRMA was destined to go straight up the east coast of Florida and my community of Barefoot Bay was scheduled to get hit until IRMA changed her mind and took a westerly turn and hit the west coast. I spent several days in Stuart with my son which is 75 miles south of Barefoot Bay...we had severe winds and lost power and some trees but no damage to his new house which he had constructed with high impact windows and literally hurricane proof as he is close to the Atlantic. There were many downed trees in the community and some flooding. The hardest hit on the east coast was Ft. Pierce which is about 35 to 40 miles south of Barefoot Bay. The flooding was terrible and navigation was impossible. I drove south via US #1 to Stuart, however had to return home via Hwy I-95 because of the flooding. The Florida Keys were just about wiped out as you can imagine. There is nothing to go home to. I volunteer at a Church thrift shop on Mondays and took a telephone call from a woman who lost everything in Key West and wanted directions to the food pantry next to the church as she had no home, no food and no clothing...just nothing!!!!!!! How grateful I felt to still have my house intact though my yard, a tree and some damage to a deck was all I received. My community had tornado warnings and was hit in some places however, our complaint was no TV or telephone service for a few days. Many lost power for up to 5 or 6 days...I had power but no TV, telephone or internet. Wait, there is more....after Irma left the Keys, she took a path up the west coast of Florida and had fun flooding the streets of Naples, Marco Island and all the way to Tampa. My daughter lives in the Venice area and had some minor damage to her house, but mostly trees and landscape. There was local flooding and no power for almost a week. All in all.....Florida was saved from what might have been. Barefoot Bay is a large community of manufactured homes and evacuation is mandatory. Those who stay know that they will receive no help if they need it. We had 3 hurricanes in the month of August 2004 and had extreme damage to our home so IRMA was a "piece of cake" for me. Thanks for your concern, Tom...love to hear from you! We live in Spring, which is on the northern edge of Houston, so got a lot of rain but not much flooding. We live in a subdivision that slopes upward, and are on the back (high) side of the subdivision, so came out of the hurricane without any problems. Tom, I faired quite well. Only a lot of "tree trash". I stayed with my son in Clearwater and came home to find that neighbors had cleared all the tree debris in my front yard to the curb. Great neighbors. God was good to me and my entire family & neighbors. Attached is a little humor about a tree down at my son's. Dixir and I made it through Irma just fine. Lost a mountain or two of yard debris - tree limbs and leaves and lost power for two days and therefore all frozen and cold food but horse, fence, yard, etc were unscathed even though eye passed directly over Lakeland. We were luckier than most. Big power outages in Polk County - 80% and it is all back on as of today. Larry: Hey Tom, here's a link into my photos of the reunion. I wanted to get the link to you before the storm. Me: Should of stayed in Chicago, I guess. So.., the roads are so jammed up there is no where to go???? Larry: Not so much that at this point, there's no gas or any place to stay between here and Georgia. I always knew when I bought this house I was going to ride out whatever happened in it. I think I'll be pretty safe. Me: OK, hunker in then. Should be exciting! Larry: If the eye comes over me I'm going to run out and take pictures. Larry: I am still without power and water at my home; but no major damage thank God! I moved into a hotel on Saturday after enduring hot humid south Florida for a week and not having cell service at my place either. Might be 9/23 until its done but who knows? It's nice to sleep in AC and not wake up sweating! I'm ok but it will be some time before life gets back to normal down here. Got pictures. Who names these things anyway? 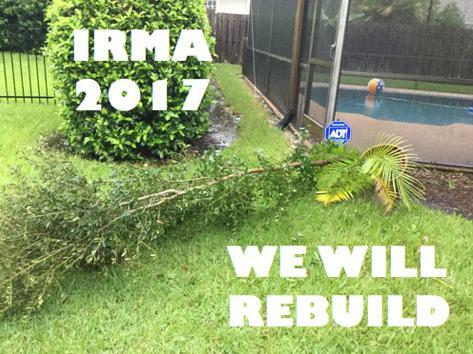 Irma?? Sounds pretty fierce; doesn't it? Well, it was! I've never been through a hurricane before. I wanted to experience this and document what I could, so I've attached plenty of pictures and videos. I got back from my 45th ('72) High School reunion in Neenah, Wisconsin, on Tuesday night September 5th. I had to work the rest of the week and, even by the time I got out on Wednesday, many stores were picked bare of essentials. I couldn't even find LP gas for my emergency generator. Lots of good that did! In all the years I've lived in Florida and North Carolina, I have never been through a hurricane. I did experience the aftermath of Fran when I was in North Carolina, and it was no fun. Somehow, I knew inside I was going to be fine. I was expecting the worst and hoping for the best. The Friday and Saturday night before the storm I sat out on my porch until late, and enjoyed the Beautiful view that I hoped would still be there after the storm. However, I was accepting of whatever was going to happen, and I was expecting to see miles of splintered homes and trees cut off halfway up. Luckily, for me, it didn't turn out that way. We boarded up the house on Friday, and spent Saturday doing odds and ends and getting last-minute items. I also picked up my sister so she would not be by herself. We go to bed Saturday night in the comfort of AC, water, and lights. There was nothing much to do except wait. So we did! I woke up Sunday morning and realized the house had no electric. Apparently it went off about 6:30am which was a full 11 hours before the eye would pass. " Great! The damn thing isn't even here yet and my electric is off! What next?" While we listened to the radio on and off, we got our safe room set up with supplies that we thought were appropriate. From time to time, I would go outside as the storm got closer. You can see from the videos how it progressed, as well as the aftermath. With the way my house was built, and the way the wind was primarily blowing, I was able to stand in front of my door and film outside as it passed. OMG! What an experience! One video has a gust of wind that I believe was at least 120 miles an hour. It was right after I filmed this video, when the tree in front of my garage split in half and fell. I understand from the news that the highest gust recorded in Naples was around 140. We never did use our our safe room; but we did come close to going in there. I could actually feel my house vibrating as I was filming. Looking at the radar plots after the fact, it appears to me that my location was right under the worst part of the storm, and that it was the eye of the storm going past me. At first, camping out at home was kind of fun. It quickly got old. It's not cool when you have to go out to the front yard with a cooler and get storm water to bring in, in order to flush the toilets. In the dark! I was using my driveway solar light tops as candles. Did I mention it's hot and humid? 24-hour sweat. After the Storm finally passed and it cleared up, the weather was hot and humid with no breeze whatsoever. Oh, and there's no cell service where I live and I have to drive 8 miles before I can pick a signal up. Gas?? Forget it! It was impossible to find a hotel between here and Tennessee. But after 6 days I couldn't stand it anymore! I started calling local hotels, and got a room 20 miles away for 4 nights on that Friday night. We finally got our electric back on Tuesday afternoon and cell service around that time or Wednesday. I came through luckier than many, and for that I am grateful! Through the grace of God, and the spirit I carried with me from my reunion, somehow I know everything is going to be okay. Tom - What a storm. I evacuated twice! We decided to put the hurricane shutters up on our home in Ft. Lauderdale when the storm was still a few days out. I have two handicapped parents who live with us and we decided it would be best to evacuate. Fortunately my wife and I purchased a lake house up in the center of the state for weekend use and as a destination for retirement. Figuring that since its 100 or so miles from either coast it would be the safest place to ride out the storm. So we packed up and went there. Unfortunately, as the storm approached, predictions indicated that Ft. Lauderdale would be clear of the storm and that the actual eye of the storm would pass directly over central Florida. So we packed up and went back the Ft. Lauderdale. As it turned out the storm was pretty vicious at both houses. Wind gusts were over 100mph at both places. I have a 26' sail boat that came loose and spent most of the storm getting up close and personal with my pier. As I write this all electrical service and internet are back on at both places and I enjoy new unobstructed views as most of the trees are gone. Both houses came thru unscathed. 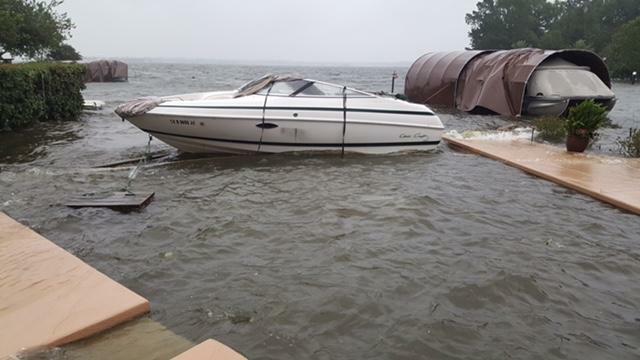 I lost the pier twice already from other storms so once again I'll have to write a small check to the lumber yard and spend a little time in the lake doing repairs. The sailboat moved a 600 pound concrete anchor 50 ft to be able to get to the pier! I wish I was there to see what it looked like when it did that!! My wife thinks its time we trade it for a pontoon boat and I think she's right. We have a home in Bonita Springs, Florida and flew North just prior to Irma's arrival! We returned this past Friday and have been very fortunate. We had power and water upon our arrival with no damage to our home except for the collapse of our pool cage which was resting in the pool! Today is Wednesday and our pool cage has been removed and should be replaced in two weeks.I hope all of you with property in Florida did not experience damage and all is well! Well, I hate to not contribute to the article, but I have learned my lessons for hurricane weather awhile back.............all windows and doors retrofitted to Miami Dade hurricane building code, only native palm trees on the property and a whole house generator run from a 250 gallon underground LP tank. I hate to say it in light of others' misfortunes, but I would have not been affected by Irma passing by except for a cell tower that got knocked out that degraded my cell signal strength for the better part of a day. Thanks for asking, Tom. As you know, Texas was hit very hard. 50 people dead, 200,000 homes damaged, 1,000,000 people displaced and an estimated 180 billion dollars in damage. Even this long after the storm there are whole neighborhoods under water. It's really sad. Connie and I feel very blessed that we had such little damage. 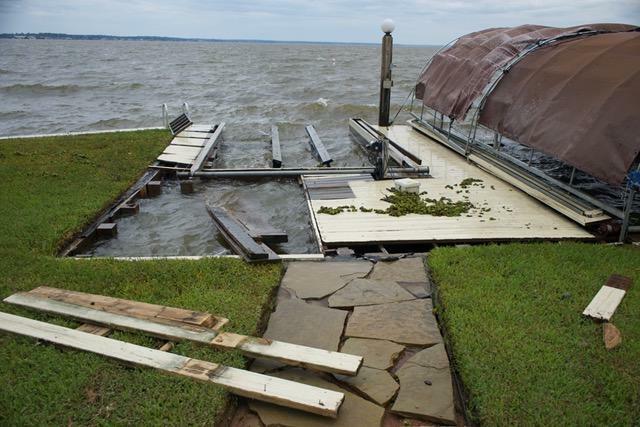 Our boat dock was damaged, lost a pool filter motor, two air conditioners and a car but no damage to the house. Some of our neighbors weren't so lucky. Attached are some photos. In one you will see one of our neighbors' boat's in the next door pool. My best to all of my Campion brothers. I have such great memories of you all. Frank. 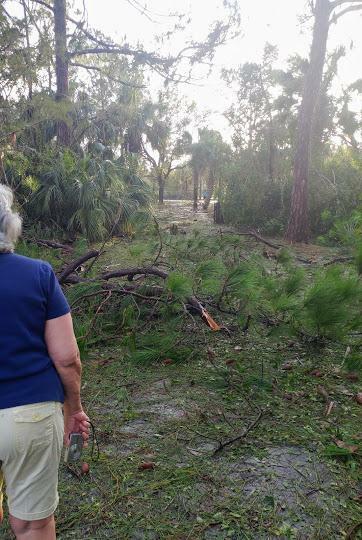 Here in Palm Beach County, my wife and I lost some trees and part of a fence, that's about it. Some of us knights may be over in the Ft Myers/Naples area. Hope they made it through A-OK as well. Please ask Knights esp Jebbies to pray for a new benevolent government in Venezuela. My wife and I have family there, and we have alumni from there, also. After congratulating ourselves on our foresight, Katie and I beat the crowd out of Dodge on our way to Lakeland (Orlando Area), where our eldest daughter and her husband reside. Just like Mary's little lamb, Irma followed us right up the Florida Turnpike. Subsequently, we hit the road for Tallahassee along with about 5,000 other friendly and courteous evacuees. Our youngest grandson works there as a legislative financial analyst for the state. Tim is 18- and finished college early. Of course the storm touched us there, but we were only without power for about six hours. We returned to Boca a week later after our power had been restored. There was only minor damage to the foliage, and catastrophic damage to a tub of sour cream that was inadvertently left in the fridge. We finally got our Internet back yesterday. Of course we're used to a "little" weather down here, since we've lived in Florida for the last 39 years. I can't tell you how much I miss the Campion Barn, where they posted, "many are cold, but few are frozen" each winter. Joe Schork and I keep in close touch. He came down to visit in July along with his granddaughter, Sophia Clarke. We are both in good health. I work full time with my wife in real estate. We have a book on Amazon entitled "How to Buy and Sell South Florida Real Estate". I hope this note finds my arthritic brother knights in rusty armor in good shape, especially anyone from the Class of '51 who is still hanging-on. 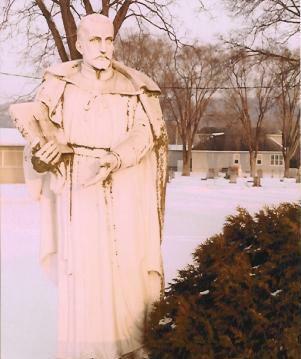 Fred Gates1970-1973 Dean of Students.